This Loncin LC3500i has been designed for low noise applications such as camping and caravanning. It is powerful and incredibly reliable making it the ideal portable generator. This fantastic generator has a fuel capacity of 10 litres and rated output of 3kw (240V) of continuous power. It reduces fuel consumption by up to 25% making it incredibly economical as well as reliable. Thanks to the carefully developed inverter technology, a lightweight microprocessor replaces a traditional heavy alternator and helps maintain a smooth, consistent output power with no fluctuations. Thanks to smooth output this new generator from Loncin can power sensitive products such as laptops and televisions, which is great if you are away on a camping or caravanning holiday. This model is also remarkably quiet at just 52dB(A) @7M, which will provide you with peace of mind that you won’t be making any noise disturbances. It even has an eco throttle which helps to keep the noise down in low loads, as it varies the engine speed to suit the applied load. The eco throttle and a DC output included for battery charging, makes it a very versatile unit aswell as low in vibration. 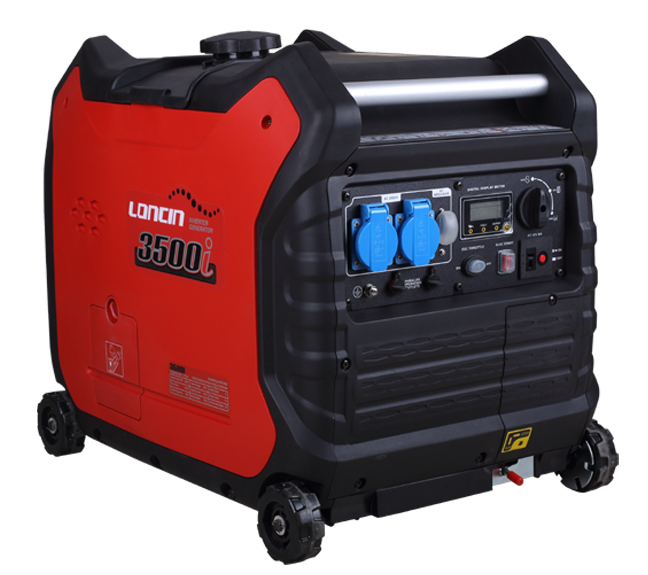 Low in carbon emissions the Loncin 3500i Inverter really is a generator for the modern age, with a powerful 212cc, single-cylinder, 4-stroke OHV engine. 4-stroke engines are economical, environmentally friendly and neighbourhood friendly! The LC3500i features a integral folding handle which makes it ultra easy to transport on its own wheels . This style generator is the ideal choice if you want cheap, consistent electricity for leisure use or as a back up at home! Loncin’s aim is to lower carbon emissions but still use the latest high-end technology to develop a range of economical and reliable prodcts. Please contact us for full details and availability.